Introducing our new series, Discover Rwanda. In this series, we will write about and discuss interesting and mostly unknown facts about Rwanda that most people don’t know. Rwanda is a very special place to live and to visit, and we hope that this series elucidates why this is so. Women hold 64 percent of seats in the lower house of Rwanda’s national legislature, the largest share of any country. 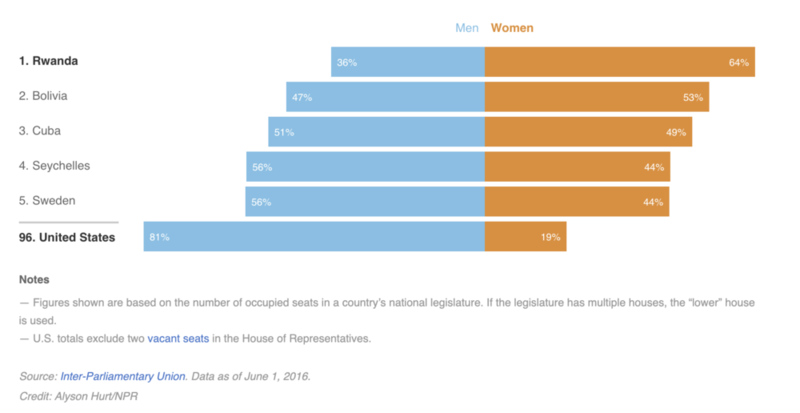 For comparison, only 19 percent of seats in the U.S. House are held by women. The call for equality has been led not by thousands of women, but rather by one man — Paul Kagame, the current president of Rwanda. Passed in 2003, Rwanda’s new constitution decrees that 30 percent of parliamentary seats be reserved for women. Kagame wants to not only catch up to the West in gender equality, but he also wants to leap frog ahead of it by encouraging and investing in female education and leadership. Rwanda has embraced Kagame's policies and even went beyond his mandatory minimum of 30 percent of reserved parliamentary seats. In the 2003 election, 48 percent of parliamentary seats went to women. Today, an unbelievable 64 percent of all parliamentary seats are held by women. Rwandan politics is viewed as the world’s leading gender inclusivity model, which has inspired leaders in the United States and all over the world to encourage and invest in female involvement in politics. The Rwandan gender inclusivity model has had a huge ripple effect across the globe: now more than ever, women are becoming more involved in politics. Rwanda’s innovation has improved the lives of millions of women all of the globe and serves as a beacon of hope to improve gender inclusivity. On top of the country’s unparalleled beauty and wild adventures, Rwanda’s gender inclusivity makes it an extremely interesting and amazing place to travel for people who come from all walks of life.